Throughout our body, we have energy centers called chakras, a Sanskrit word meaning wheel. Although there are hundreds of chakras in us, there are seven which govern our bodies on four different levels: physical, emotional, mental and spiritual. 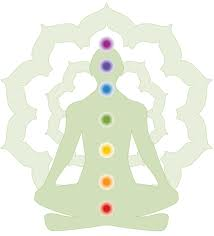 The seven main chakras are swirling wheels of energy that align up the spine from the base to the top of the head. Each chakra has a color or vibration and a set of characteristics unique to itself. As we live our lives, we have all experienced traumatic and painful experiences that result in trapped energy in our chakra (and meridian) system. Energy work or energy medicine is the work of moving stuck energy out of our energy system in order to attain optimum health and well-being. I have assembled the information below to help you learn your chakras and identify areas for healing, growth, and development. I would also recommend the books The Book of Chakra Healing by Liz Simpson and Wheels of Light by Rosalyn L. Bruyere if you would like more in-depth information. Spiritual and Emotional Aspects: Knowingness–The right to aspire. Dedication to the divine consciousness and trusting the universe. Learning about one’s spirituality. Our connection to the concept of “God” or a higher intelligence. Integrating one’s consciousness and sub-consciousness into the super-consciousness. Physical Manifestations: Tension headache, migraine, depression, Parkinson’s disease, Schizophrenia, Epilepsy, senile dementia, Alzheimer’s, many mental disorders, confusion, and dizziness. Physical Manifestations: Learning disabilities, coordination problems, sleep disorders, visual defects, short-sightedness, long-sightedness, glaucoma, cataracts, sinus problems, ear problems. Spiritual and Emotional Aspects: Relationships–The right to speak. Learning to express oneself and one’s beliefs (truthful expression). Ability to trust. Loyalty. Organization and planning. Spiritual and Emotional Aspects: Relationships–The right to love. Love, forgiveness, compassion. Ability to have self-control. Acceptance of oneself. Physical Manifestations: Heart disease and diseases of the immune system. High blood pressure. Passivity. Muscular tension. Spiritual and Emotional Aspects: Personal power–The right to think. Balance of intellect, self-confidence, and ego power. Ability to have self-control and humor. Physical Manifestations: Digestive problems, ulcers, diabetes, hypoglycemia, constipation. Nervousness, toxicity, parasites, colitis, poor memory. Spiritual and Emotional Aspects: Feelings—The right to feel. Connected to our sensing abilities and issues related to feelings. Ability to be social and intimacy issues. Physical Manifestations: Eating disorders. Alcohol and drug abuse. Depression. Low back pain. Asthma or allergies. Candida & yeast infections. Urinary problems. Sensuality issues as well as impotency and frigidity. Physical areas: Uterus, large bowel, prostate, ovaries, testes. Spiritual and Emotional Aspects: Survival–The right to exist. Deals with tasks related to the material and physical world. Ability to stand up for oneself and security issues. Physical Manifestations: Anemia, fatigue, lower back pain, sciatica, depression. Frequent colds or cold hands and cold feet.